Charlotte Goodman has had enough surprises. In fact, she reached her life’s quotient when her husband of five months walked out on her, only to abruptly change his mind a few weeks later and move back in. Stung by a whiplash of grief, resentment, and confusion, Charlotte calls a time-out, taking a small apartment where she can figure out what she wants. Instead, the thought of making even the simplest choices triggers an anxiety attack. In order to get out of bed in the morning, she must concoct a to-do list for each day, The Plan, one with absolutely no surprises. Charlotte knows all this self-absorbed introspection isn’t good for her, but she’s running out of people to turn to, as seemingly everyone in her life is pressuring her to make an immediate decision about her future. Then her new friend Francesca—an impulsive, smartass co-worker—offers Charlotte salvation in the unlikeliest of places: the fast-paced, super-tough, bump-and-bruise-filled world of roller derby. Sure, it’s dangerous. Yeah, she could get hurt. But what’s a little physical pain when healing your soul is at stake? The question is: whether she’s on or off the track, will Charlotte be strong enough to stand on her own two feet? 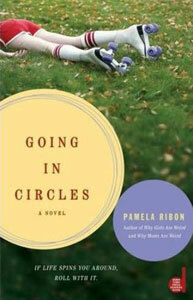 Going in Circles — Novel. Simon & Schuster. Release date: May 18, 2010. Wal-Mart “ALL YOU” Book club pick, May 2010. Oprah.com Book Club pick, June 2010.